At this point I have reviewed about a half dozen aftermarket target barrels for the Ruger 10/22. Most are designed to significantly improve accuracy however some are better at that goal than others. 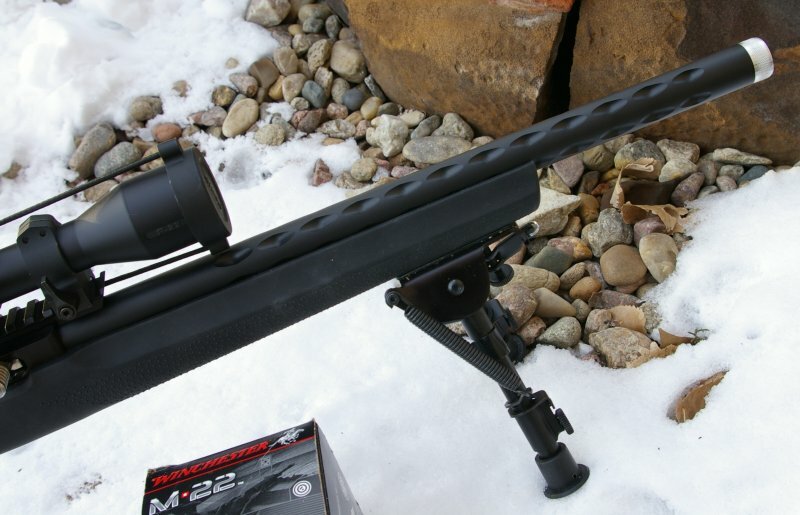 Generally this accuracy improvement comes in the form of a heavy .920" bull barrel, however a few companies are offering sleeved or tensioned barrels which drastically drops weight all while usually maintaining good accuracy. The Beyer 10/22 Barrel is one of these hybrid sleeved barrels and has become one of my favorites because of its features. weight, and performance. Clint Beyer has been an avid hunter and shooter for many years but could not find a 10/22 barrel he liked. After his retirement from the U.S. Armed Forces he started Beyers Barrels in 2006 to create precision custom barrels and special orders. Several of his barrel styles are sold in Brownell's catalog, however Beyer also handles custom orders directly. Beyer Barrels offers a wide selection of barrel lengths, fluting options, and muzzle options with prices ranging from $189 to just under $300 with all the options . After looking through Beyer's large selection and barrel configuration options, I settled on a 16" version with a diamond cut fluting and threaded muzzle specifically for future use with a suppressor which I have been waiting and waiting on my paperwork for. It has been demonstrated over and over to me, that the single most dramatic improvement in accuracy to your stock 10/22 is a swap to an aftermarket match grade barrel with a Benz style match chamber. In this case, I mounted the Beyer 10/22 Diamond Pattern Barrel to a complete Force Production billet 10/22 receiver with match trigger assembly in a Houge overmoulded stock. The Beyer barrel fit just a little snug in the Force receiver and similarly in a stock Ruger 10/22 receiver I test fit as well. I topped the barrel with my trusty Nikon P-22 2-7x Scope which I have grown to love as a spectacular all around scope. The huge advantage of any of the sleeved barrels is the substantial weight reduction. 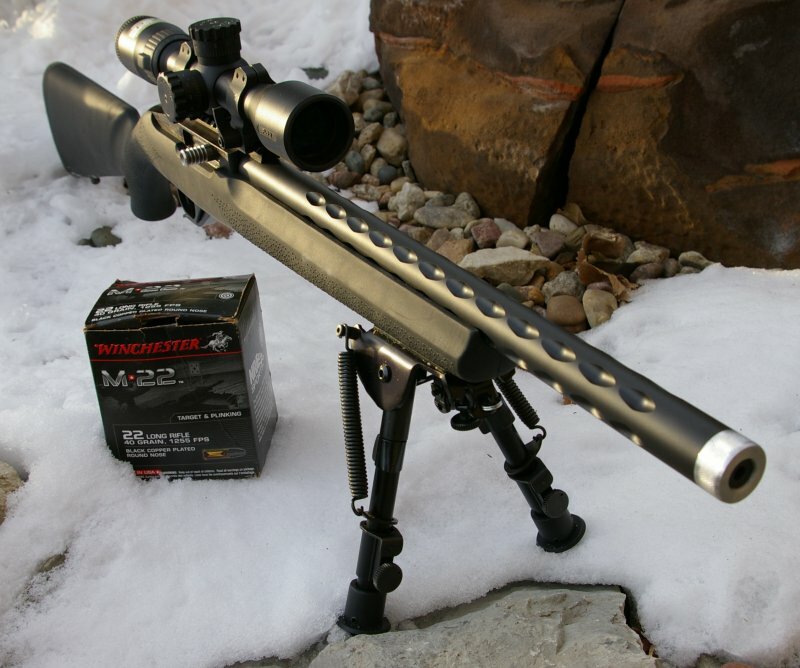 This huge weight reduction can greatly increase shooting comfort where extended off hand shooting occurs or paces add up to miles on a hunting trip. I have also found that younger shooters find a lighter rifle more manageable for offhand shooting. If you have handled a Whistle Pig or Tactical Solutions barrel, the Beyer feels marginally heavier. This may be that the stainless liner appears just a bit thicker than comparable barrels, the sleeving is made from 7075 vs 6061 which is a tad heavier, or that the finish is Alumihide or Ceracoat vs anodized which also adds just a bit more weight. Whatever the reason, the barrels feels more substantial that other similar aluminum sleeved barrels. Like many Ruger 10/22 aftermarket match barrel manufacturers, Beyer uses a Benz style chamber on rifled stainless liners. This chamber is not so tight that you begin having problems with feeding, but is tight enough to deliver exceptional accuracy. For most of us, it is a perfect compromise between functioning and accuracy. The main advantages of a sleeved barrel are that they are much lighter and can potentially be more accurate during sustained fire due to a heat sink effect keeps the barrel cooler. Cooler barrels have less heat deformation which produces better consistency and accuracy; so the theory goes. The Beyer 10/22 barrel does indeed sound about like the other aluminum sleeved barrels, however it differs in a couple ways. First is the 7075 T-6 aluminum construction versus the less stiff 6061 aluminum. This upgrade adds both dimensional stability, durability, and increases accuracy according to Beyer. For those barrels with threaded muzzles, the upgrade also delivers more durable threads to handle more use from suppressor or brake installation and removal. The other main feature is the Alumihide or Ceracoated barrels. The reason they do this is nothing against anodizing, however if you anodize the barrel sleeve, it throws the internal dimensions out of alignment due to an inconsistency in the thickness of the anodizing down the internal hole in the sleeve. Anodizing also delivers a non-stick coating. So this creates two issues, the first being that when the liner is epoxy'ed in place, the epoxy has nothing really to hold onto which means you could have your liner start walking down the barrel as the bolt slams into it over and over again. Although rare, I have heard of this happening with some Tactical Solutions barrels, though mine has never had an issue. 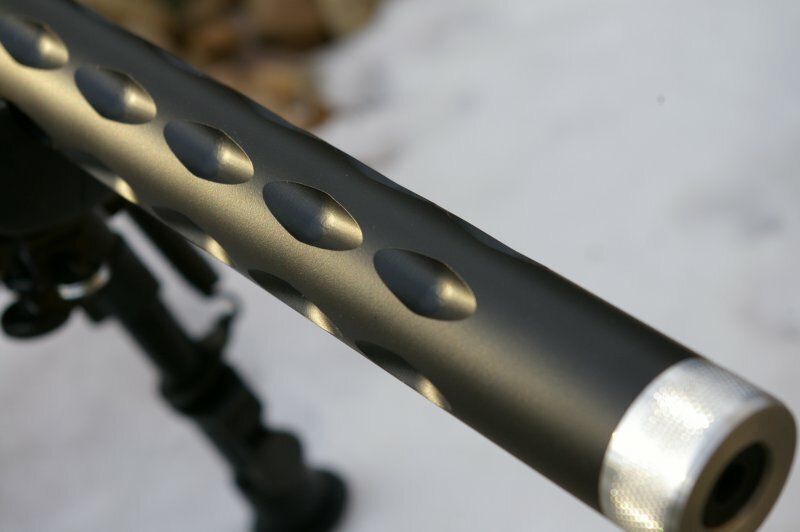 The other issue is that anodizing does cause potential highs and lows in the barrel sleeve, which in turn does not allow the liner to have a consistent mount which will cause accuracy to degrade after the barrel starts to heat up. 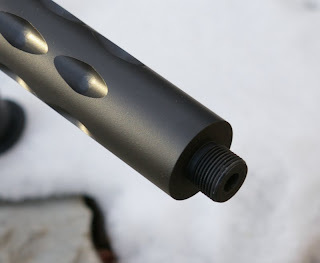 Beyer circumvents all this by coating the barrel after the liner is mounted in the sleeve and his choice in most cases is a highly durable black Ceracoat finish. Other features include the Diamond Fluting and a knurled thread protector for the muzzle. The fluting maybe reduces weight by an ounce, however it looks stunning and the silver finished thread protector on the threaded muzzle adds to the looks of the barrel while delivering a highly durable thread protector. As was expected the barrel mounted without any issues into the Force receiver and snuggled into the Hogue stock as any bull barrel would. I am happy to report that my barrel fed anything and has delivered reliability as good as my factory barreled 10/22. My favorite plinking and practice rounds, Winchester M-22 and Winchester 555 bulk packs, were both very accurate and extremely reliable. Throughout testing, I also found the barrel to not be particularly picky about ammo. Occasionally you will find a barrel that has a strong preference for one type of ammo and a strong distaste for the rest. The Beyer barrel generally performed well with any ammo I stuck into the magazine. As I have for so many tests, I have recorded the accuracy results here for comparison to the rest of the barrels tested here. As of the writing of this article my best group was an tight litte 5-shot .43" group with CCI Standard Velocity ammo at 50-yards. This is a bit better performance than I have seen with my Whistle Pig and Tactical Solutions barrels. At this point I have not seen the accuracy delivered from the super premium barrels like Fedderson, Kidd, and Magnum Research, however it can deliver accuracy in the .4s" at fifty yards which is outstanding for a non-tensioned lightweight barrel and plenty accurate to drop a squirrel at 75-100 yards. After reviewing this barrel, it will most likely spawn another barrel juggling exercise to find a permanent home on my PWS T-3 Summit Action and Trigger Group. This combination should deliver an extremely quiet host platform for my YHM Mite supressor on order. This is an impressive barrel and especially considering that the base model are about the same price as the Tactical Solutions barrels. For the money, the barrel has been a better performer and has a number of very cool looking fluting options to choose from which can add a unique touch to your next 10/22 build. From an accuracy perspective, it would seem from my testing that the Beyer Barrels are king of the hill of aluminum sleeved barrels however every barrel will perform a little differently. This is just one barrel style the company offers. 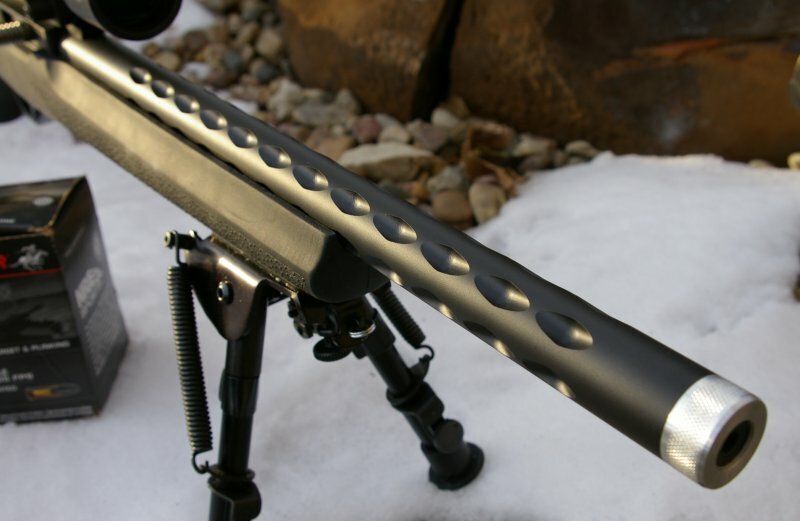 Beyer Barrel has a number of barrel lengths, fluting, and muzzle finish options to choose from including AR15 .22 rimfire barrel. If you are looking for a great lightweight option to drop a pound or so from your rifle, I would highly recommend you take a hard look at what Beyer barrels offers. Good article, easy read. Any updates on the Beyer barrels?